"While I understand there is a debate about the 'surveillance society', let's not lose sight of the fact this is a very vital tool to the police." "When the prisons are full they will move more offenders into police cells [then] court cells. And when those are full the whole criminal justice system will grind to a halt because you won't be able to bring people to court for trial." "Numbers reached 80,812 - up 154 on last week which leaves just 320 spare places including those in police cells under "Operation Safeguard"." I think I've only lived in about 7 postcode areas. "smartphoneness" defined for benefit of user (in US), for handset mfr (in Europe), for opco (In Japan). Interesting. "Need to remember something? Send me a direct message, and I'll tweet you back. For example, 'd timer 45 call mom' reminds you in 45 minutes." Pretty enigmatic trailer even by the standard of these things for witness-protn-family-move-to-mysterious-community series. Great British actors though, and co-written by friend Chris Dunlop, and he's brilliant. "Government plans for new police powers to stop and question people were greeted with a barrage of criticism yesterday, after it emerged that senior police officers had neither requested the change nor been consulted." Rather than Release Early Release Often. I'd been grumpily trying to prove that Twitter was only about sleep, lunch and commuting, though at some point I'd left it and moved on to something else, possibly because I needed a kip, a snack or to get back to work. Today, Matt and Foe's pictures of Tweetvolume reminded me of it, and I thought about Maslow's hierarchy of human needs, which contends that "as humans meet basic needs, they seek to satisfy successively higher needs that occupy a set hierarchy". At the lowest, physiological level, lunch and sleep are big at the time of writing (and I assume that food terms are much bigger in aggregate). At the safety level, home is very popular. At the love/belonging level, friends is monstrous (and interestingly, 5x the size of friend. And I stuck going in there because it seemed to a lower level thing than esteem...) At the esteem level, work is big. At the final self-actualisation level, goodness is all. Thus we can confidently conclude that Twitter is about social snacking with friends after your taxing commute from work and before having a nice sleep at home. 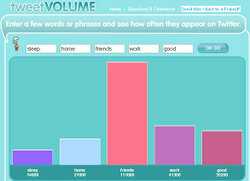 Unsurprisingly for a techno-social tool, its sweet spot is the love/belonging level. You may be able to come up with better search terms, or frankly disprove this. But it's probably not worth it, because that experiment was un-scientific on so many levels: I did it in five minutes, my terms don't fit Maslow's hierarchy levels well (and the hierarchy itself is questioned by other scholars), and I made sure I drew conclusions to support my original hypothesis. So there. All Twitter tools and mashups in one place suggests a couple of sites (like TwitterBuzz or http://twitter.isite.net.au) that are working out the most cited terms or links, but I can't get them to work. Perhaps Tweetvolume or Twitter themselves could simply provide a list of the most Twittered terms. Rome's ruins are becoming more-ruined as budgets are insufficient to keep up with the maintenance and preservation requirements. The tension between history-tourism and the present. Figures cut and lifted out from book covers, photographed. Nice. Unitended consequences of smoking bans. 2005 show on imagined architectures, also at the Hayward in 2004. The book is great. "this means they will not include the time Blair used the c-word to describe a senior Labour figure from the Eighties"
Jones puts boot into Antony Gormley via Henry Moore. The Field works were great but he has a point about the body casts - too easy. 10 parts, 9 writers and the end by readers? I am a completely horizontal author. I can’t think unless I’m lying down, either in bed or stretched on a couch, and with a cigarette and coffee handy. I’ve got to be puffing and sipping. As the afternoon wears on, I shift from coffee to mint tea to sherry to martinis. No, I don’t use a typewriter. Not in the beginning. I write my first version in longhand (pencil). Then I do a complete revision, also in longhand. Essentially, I think of myself as a stylist, and stylists can become notoriously obsessed with the placing of a comma, the weight of a semicolon. Obsessions of this sort, and the time I take over them, irritate me beyond endurance. I suppose my superstitiousness could be termed a quirk. I have to add up all numbers: there are some people I never telephone because their number adds up to an unlucky figure. Or I won’t accept a hotel room for the same reason. I will not tolerate the presence of yellow roses — which is sad, because they’re my favourite flower. I can’t allow three cigarette butts in the same ashtray. Won’t travel on a plane with two nuns. Won’t begin or end anything on a Friday. It’s endless, the things I can’t and won’t. But I derive some curious comfort from obeying these primitive concepts. See also: How we work: writing standing up, in bed, Compose Yourself, and the The Paris Review Interviews website, a treasure trove. Judges have well and truly got the hump now. John Reid prepared to declare state of emergency to "suspend key parts of the human rights convention if the law lords do not overturn a series of judgments that have weakened the anti-terrorist control order regime." 1000 readymade, free, UI icons. Nice. "Climate change map sends 12 capitals further south", like walking cities drifting towards the desert as the temperate landscape heads north underneath their feet. Don't really understand the diff betw this and Modest Maps. Both look great though. And that's my 400th "toread". "I've been hoping for a long time that one of the LAMP technologies would break through into corporate IT, and it looks like Ruby could well do it." RIM BlackBerry 8830 (Verizon Wireless) Reviews. Smartphones Reviews by CNET. Side by side comparison of new Curve (has camera) and 8830 (is bigger). Looking forward to trying out both. "Mule is the leading open source ESB (Enterprise Service Bus) and integration platform. It is a scalable, highly distributable object broker"
Lighthouse: Simple hosted Issue tracking, bug tracking, and project management software. "A measure of the average number of days that a company takes to collect revenue after a sale has been made. A low DSO number means that it takes a company fewer days to collect its accounts receivable." Purse Lip Square Jaw: "[W]e need many different prostheses..."
Latour (must read): "We promise nothing more grandiose than a store of aids for the invalids who have been repatriated from the political frontlines [...] Politics might be better taken as a branch of disability studies." Second Kev trade book, this time drawn by Strontium Dog Ezquerra. Delicious. "they have a labyrinthine quality that comes out in the end to be nothing but the decorative. This ornateness is perhaps part of an idea about evil. A kind of complicated visual blankness - evil as unintelligible ground"
Fox's essay from the Overflow and Extinction book. Peter Peri needs some decent web presence. His Art Now show at the Tate Britain is interesting: drawing excellent, paintings harder to get. They're rightly resisting an exemption for death-in-custody. The gov knows that prisons and private contractors would presumably trigger contract re-negotiations into to mitigate the risks. Difficult. "The impact of the Blair years on the rule of law, the creation of the Ministry of Justice and the impacts of the Clementi reforms were the among the subjects under lively discussion 18 May 07"
"Cultural impedance is something that's also inhibited many otherwise highly useful and potentially beneficial IT initiatives"
Very interesting on rebuilding, on mging sales. "built a recurring revenue model. We now have 90% of our revenue as recurring. I removed the whole sales force so that my expenses are equal to my recurring revenue"
Russell has slowed down/raised twitter's minimal barrier to input by making it postcard based. I'd like to see him do the same for output by making the postcards visible only if you arrange to pop round his house for tea. To read/visit on bio- and nature-influenced design. See also Calatrava and the godfather, Otto Frei. "So, with surprising speed, the tools of the hand are becoming extinct. [...] This is a lamentation for lost tools [...] There is a secret bond between slowness and memory, between speed and forgetting"
Smells like the kind of military history metaphor that might contain a counter-example if we dug hard enough. Jones likes Uffizi collection at Dulwich. "The undisciplined salesperson will chase every inbound inquiry in the hope of finding the “bluebird.” The disciplined one will ask qualifying questions of the inquirer." On deals and the need to qualify vigorously or risk wasting your time. "The best way I’ve found for agile teams to estimate is by playing planning poker [...] combines expert opinion, analogy, and disaggregation into an enjoyable approach to estimating that results in quick but reliable estimates"
"AJAX is not designed for the high-latency slow and flaky wireless connections [...] You couldn't design a less appropriate technology." - Good rant against the mobile web2.0 techno-utopians. Start of a trend in offshoring away from captive centres to true outsourcing? Characterised by the media as idio/bureaucracy but I wonder if someone made one area of activity simpler at the cost of the inherent complexity popping up unexpectedly elsewhere (cf Tesler). "If it's in our villages, are we really moving towards an Orwellian situation where cameras are at every street corner? And I really don't think that's the kind of country that I want to live in." Redmonk x 2, Burton x 2, Brenda Michelson of Elemental Links, Alan Pelz-Sharpe of CMSWatch. "We either need to come up with a new term to mean “production ready and scales,” or reclaim the word enterprise. (Which begs the question: reclaim from who?)." Peter Yared's Musings: What Happened to LAMP? Interesting on the increased switching/install/supporting costs of LAMP where enterprises have already made a Java/.NET committment: LA still make sense, M somewhat, P is difficult - this co switched to Java.